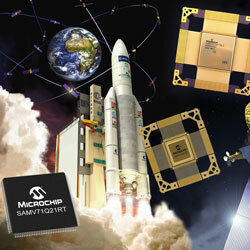 Microchip has released the space industry’s first Arm-based MCUs that unite the low-cost and large ecosystem benefits of COTS technology with space-qualified versions that have scalable levels of radiation performance. Based on the automotive-qualified SAMV71, the SAMV71Q21RT radiation-tolerant and SAMRH71 radiation-hardened MCUs implement the broadly deployed Arm Cortex-M7 SoC, allowing more integration, cost reduction and greater performance in space systems. The devices enable software developers to start implementation with the SAMV71 COTS device before going to a space-grade component, significantly decreasing development time and cost. Both devices can use the device’s full software development toolchain, as they share the same ecosystem comprising software libraries, BSP and OS first level of porting. Once preliminary developments are completed on the COTS device, all software development can be simply swapped out to a radiation-tolerant or radiation-hardened version in a high-reliability plastic package or space-grade ceramic package. The radiation-tolerant MCU reuses the complete COTS mask set and provides pinout compatibility, initiating the transition from COTS to qualified space parts immediate. While the SAMV71Q21RT’s radiation performance is perfect for NewSpace applications such as LEO satellite constellations and robotics, the SAMRH71 provides the radiation performance ideal for more critical sub-systems like gyroscopes and star tracker equipment. The SAMV71Q21RT radiation-tolerant device guarantees an accumulated TID of 30Krad (Si) with latchup immunity and is non-destructive against heavy ions. Both devices are completely immune to SEL up to 62MeV.cm2/mg. To facilitate the design process and expedite time to market, developers can use the ATSAMV71-XULT evaluation board. The devices are supported by Atmel Studio IDE for developing, debugging and software libraries.